Do you think Wisconsin is creating jobs at a faster rate than most other states, at about the same rate, or is Wisconsin lagging behind other states in job creation? Clearly, the data doesn’t support either of the other two possible answers. Even if you restricted the data to private-sector jobs, the numbers would change but Wisconsin would still lag behind. Wisconsin’s lagging job growth has been well-publicized both in the press and by partisans of the other side. Yet almost half (47.5%) of voters willing to hazard an answer gave a wrong one. Of those identifying themselves as Republicans, three-fourths (73.6%) got it wrong. And about a fifth of Republicans believed that Wisconsin is creating jobs faster than most other states. Why did so many voters—especially Republican voters—pick a wrong answer? Much of the explanation, of course, comes from our human tendency to embrace facts that support our belief system and filter out those that challenge it. Perhaps the placement of the question, immediately following one that asked whether voters approved of Scott Walker, influenced the responses: they may have reinterpreted the question as asking whether Walker was good for the economy. “Our labor market economists note the seasonally adjusted total nonfarm job gain from May to June of 17,500 is the largest month-to-month gain for any month since April 1992….” This is an example of taking advantage of data volatility stemming from small sample size. Using the same approach, one could argue that the job loss from March to April of 21,900 is the largest month-to-month loss since April 2009, the height of the Great Recession. “Wisconsin ranked 21st in total private sector jobs created from December 2011 to 2012 with a gain of 32,282.” Using absolute numbers, rather than percentage gains, moves Wisconsin up in the rankings since most states are smaller. Also not mentioned is that this job gain represents a percentage increase of 1.01%, compared to 1.77% for the average American state. “Wisconsin’s total private sector job gain outpaces Iowa and jumped 11 spots in percentage of private sector job growth to 33rd highest at 1.4 percent, higher than neighboring Illinois.” Since January 2013, Iowa has gained jobs at a higher rate than Wisconsin, but it is smaller so using absolute numbers gives the advantage to Wisconsin. Illinois has gained at about the same rate as Wisconsin; because it is larger, its absolute gain is larger. “… Wisconsin gained over 62,000 private sector jobs in the last two years. The private sector job gains under Governor Walker are the best two-year gains under any Governor in over a decade.” The comparison is a mystery to me. There are several two-year periods that beat this number. For example the two-year period that includes Doyle’s last year and Walker’s first had a private sector gain of 63,200. There are several tricks used here. One is using numbers of jobs when comparing Wisconsin to smaller states such as Iowa and switching to percentage changes when comparing Wisconsin to larger states like Illinois. 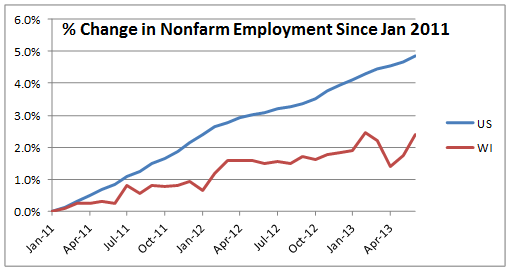 Another is avoiding any comparison to national job gains. Finally there are numerous comparisons to job losses during the Doyle administration, with no hint that Doyle had the bad luck to be governor when the Great Recession hit. It’s cherry picking of data. Some may take the poll as evidence of conservatives’ weakening grip on reality, similar to the widespread insistence that Mitt Romney was about to win the last election. It is hard to know without looking at states with Democratic governors and weak job growth. For example, Illinois’ job growth has been very similar to Wisconsin’s over the past two and a half years but has a Democratic governor. Would a majority of Democrats insist that job growth meets or beats that of other states? Does the Illinois jobs agency, in reporting monthly results, spin them to favor the governor? One question is whether a state agency, funded by taxpayers, should be in the business of spinning data for partisan purposes. While I appreciate the secretary’s desire to make his boss look good, there are number of organizations in the private sector that would be happy to take up the task. Instead they let the department do the work for them. Another is whether people in politics have an obligation to be straight with the people who support them. In this example, those most likely to be misled are supportive of Walker. Among other factors, those less supportive likely get their information from elsewhere. Is it ethical to reward one’s most faithful followers by misleading them? Finally, ignoring facts can lead to bad public policy. As Daniel Patrick Moynihan observed, “Everyone is entitled to his own opinion, but not his own facts.” In last year’s presidential debates, Mitt Romney had his own version: “You’re entitled, Mr. President, as the president to your own airplane and your own house, but not to your own facts.” If each party feels free to create its own facts, effective solutions to problems such as how to encourage job growth become even more intractable than they already are. I’m by and large a Walker supporter, but one of the dumbest things he did was make the 250,000 jobs pledge. It offends an employer like me because it assumes that government creates the job. I guess I missed Scott cosigning our loans and sitting with me as we decided to increase our staff size. Even without that it’s a stupid pledge. While Wisconsin had job losses in the 2008 collapse it wasn’t at the same level as some of the other areas of the Country. Most economists tend to argue that most recessions and recoveries are V-Shaped. The deeper the recession the greater the recovery. Our recession wasn’t as deep and as such that recovery isn’t going to be as rapid as other areas of the Country. In other words, even if you agree with every little thing Scott Walker has done as governor it’s still hard to envision the State adding that many jobs. I think the business environment has gotten better, We’re seeing clients starting to expand and our Company has gone from 4 people to 16 in the span of 18 months. That said, the recovery, both locally and nationally isn’t moving nearly as quickly as anyone would really like it to. I agree with that sentiment behind that statement but I would change “create” to “cherry-pick”. I don’t think any evidence was found of the Dept. of Workforce changing numbers, but they clearly picked either absolute numbers or percentages depending on which looked better. From my perspective, every human being falls victim to this mentality in just about every area of life. Some resort to it more than others. It would be nice if you could expect to get information without spin but I think this ignores our basic nature, which is to be biased due to our individual life experiences. The only way I know of to combat these marketing tricks is by trying to learn more about everything from a diverse variety of sources. It’s probably an impossible undertaking, but there are worse things to strive for than continuous learning. You are right that in most cases these claims are cherry-picked rather than invented. However the claim that the 62,000 jobs added over 2 years is the largest 2-year gain in ten years seems to be an invention.